Thank you, USA Today, for bringing our attention to this most entertaining Draymond Green interview from ESPN’s Sam Alipour. They wear Mario and Luigi hats. It’s charming. But we’re not here because it’s charming. We’re here because, as USA Today rightly highlights, Green credits the current Warriors dynasty in part to his decision to get Steph Curry blitzed. Perhaps “hungover” is Steph Curry’s peak mode. Let me think of one that protects his image. 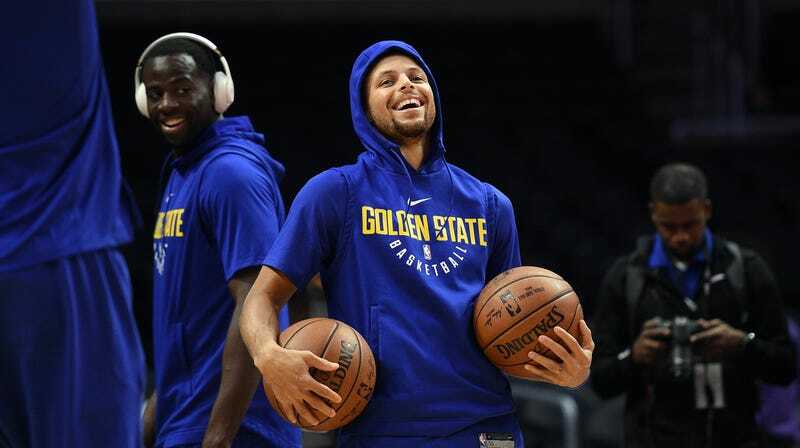 [Laughs] My favorite Steph story goes back to the beginning of all of this, right before our first title. We were in Memphis, down 2-1. Steph wasn’t playing well, and it felt like the world was collapsing on us. So he was in his room, doing nothing, and I called him: “Hey, let’s go get a drink.” “All right, cool.” So we go to Blues City Cafe, drink a bunch of drinks, eat a bunch of garbage and have a bunch of fun. And we won the next three. That moment was the beginning of our run, where it could have gone all the way left. We just needed to just get away from the game. Then we’re in Cleveland, down 2-1 in the first Finals. Steph was struggling, so I took a bottle of wine to his room. So it’s just me and Steph, in his room, crushing a whole bottle of wine—and we won the next three. Say what you want, the inference here is that Steph was struggling, and to get him to stop struggling, Draymond fed him some alcohol, like Steph is Popeye and wine is spinach, or Steph is Peter Parker and wine is a radioactive spider, or is Michael Jordan and wine is grudge-related pettiness. Draymond took action. Step one: observe that Steph Curry isn’t playing his best game. Step two: feed Steph Curry wine. Step three: watch Steph Curry go off. In short, if you find the basketball season a little bit boring now, it is absolutely alcohol’s fault. And hey, Draymond, if Steph is so receptive to your suggestions, could you persuade him to stop dangling his mouth guard on his chin? It squicks me out.